Since there weren't any doggies this week, I promised a few photos of somewhere else you should put on your list of places to visit at least once. Make sure you spend at least a few nights here sometime in your life. Next week I'll post a few more photos and tell you the name of this place and where it is. In the meantime, enjoy the beautiful May weather! With the exception of this morning's Q1 GDP report of +3.2% annualized, with consumption excellently providing a +3.6% boost, this was a very slow week for monthly economic data. The Chicago PMI (thought to be a preview of the ISM indexes next week) blew out to the upside at 63.8 (over 50 means expansion). The backlog of orders - a leading indicator - also blew out to the upside at 61.4. The Chicago Fed’s National Activity Index (CFNAI) also ticked upward. The employment cost index was up 0.6%, but the wage component was only up 0.4%, benefits balanced them out at up 1.1%. Consumer confidence ticked upward (but expectations - a leading indicator - ticked down). Home prices ticked downward (a slide that will probably continue now that federal purchasing support is expiring). ▪ The International Council of Shopping Centers (ICSC) reported same store sales growth of 5.5% YoY, and 0.2% WoW. Shoppertrak reported YoY sales increased 3.2%, and WoW sales were down 1.5%, not untypical during the spring lull after Easter. The Department of Energy reported that the price of gasoline declined one cent to $2.85 per gallon. Gasoline demand for the week surged 2 million barrels, well ahead of last year, and bringing the monthly average up as well. Inventory still is high and climbing. This is the most bullish report in quite a while. The BLS reported that last week's initial jobless claims totaled 448,000. The 4 week moving average was 461,500. This series remains in a downtrend, albeit a more muted downtrend than last year. This was the 10th straight week of increases in temporary hires. Increases in temporary staffing are a leading indicator, so this bodes well for the jobs report. Railfax recorded yet another strong week. Baseline, cyclical, and total – are continuing to increase, and continuing to increase at a rate faster than last year. 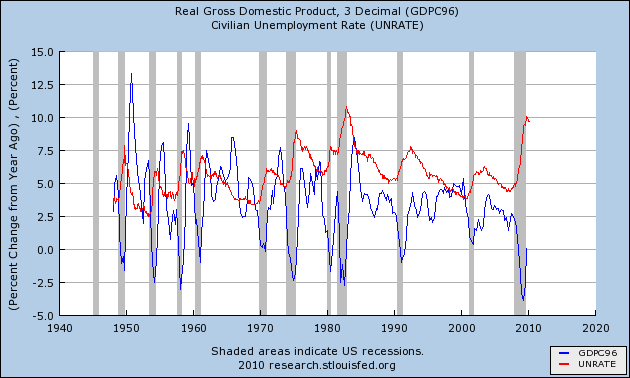 cyclical traffic in particular is now closer to its 2008 top than to its recession bottom. Intermodal traffic, which is a proxy of imports/exports, also remains substantially ahead of last year. Crushed stone and lumber, Railfax’s “recession watch” traffic, increased yet again, and crushed stone in particular is increasing strongly. Finally, Daily treasury receipts continue their surge ahead of last year. As of April 28, 2010 (20 reporting days into the month), $129.6B in withheld taxes had been collected vs. $123.5B last year, a gain of $6.1B or +4.8%. I'm sure Zero Hedge will report this 4-week data to its readers, right? P.S. I think Bonddad may be unable to supply pictures of doggies this week, but I will try to put up this evening or tomorrow a photo of a place you should visit at some point in your life -- and this time I'll try not to give it away! 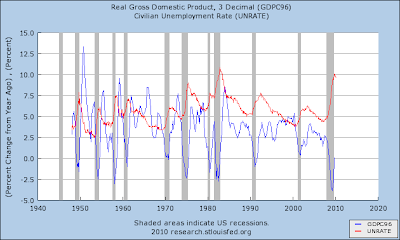 Note the real percentage change in YOY real GDP growth hits bottom before the unemployment rate starts to drop. In other words, the unemployment rate is a lagging indicator. 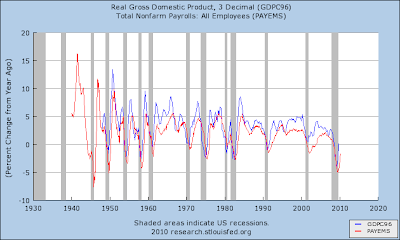 The YOY percentage change in real GDP rate bottoms before the percentage change in the total establishment jobs. But job growth soon follows. 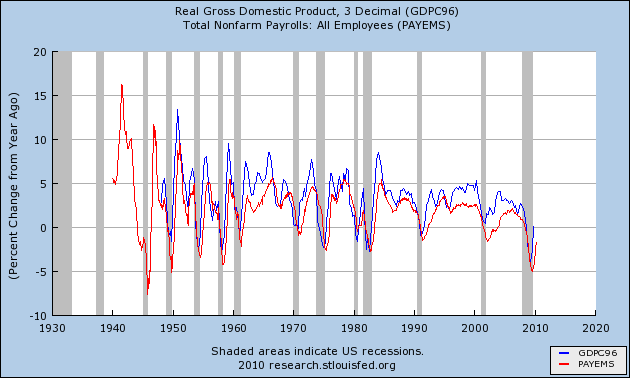 Real gross domestic product -- the output of goods and services produced by labor and property located in the United States -- increased at an annual rate of 3.2 percent in the first quarter of 2010, (that is, from the fourth quarter to the first quarter), according to the "advance" estimate released by the Bureau of Economic Analysis. In the fourth quarter, real GDP increased 5.6 percent. The Bureau emphasized that the first-quarter advance estimate released today is based on source data that are incomplete or subject to further revision by the source agency (see the box on page 3). The "second" estimate for the first quarter, based on more complete data, will be released on May 27, 2010. The increase in real GDP in the first quarter primarily reflected positive contributions from personal consumption expenditures (PCE), private inventory investment, exports, and nonresidential fixed investment that were partly offset by decreases in state and local government spending and in residential fixed investment. Imports, which are a subtraction in the calculation of GDP, increased. The deceleration in real GDP in the first quarter primarily reflected decelerations in private inventory investment and in exports, a downturn in residential fixed investment, and a larger decrease in state and local government spending that were partly offset by an acceleration in PCE and a deceleration in imports. Let's look deeper in the report. Real personal consumption expenditures increased 3.6 percent in the first quarter, compared with an increase of 1.6 percent in the fourth. Durable goods increased 11.3 percent, compared with anincrease of 0.4 percent. Nondurable goods increased 3.9 percent, compared with an increase of 4.0 percent. Services increased 2.4 percent, compared with an increase of 1.0 percent. This is good news. 70% of the GDP report increased 3.6% -- and the increases were broad-based. The largest area of PCEs -- services -- increased 2.4%, non-durables increased 3.9% and the smallest area of spending (durable goods) increased 11.3%. This is especially important as it indicates an increased desire consumers to take on longer-term payment plans. Real nonresidential fixed investment increased 4.1 percent in the first quarter, compared with an increase of 5.3 percent in the fourth. Nonresidential structures decreased 14.0 percent, compared with a decrease of 18.0 percent. Equipment and software increased 13.4 percent, compared with an increase of 19.0 percent. Real residential fixed investment decreased 10.9 percent, in contrast to an increase of 3.8 percent. While structures were down -- which is to be expected in the current real estate environment -- other investment was up. Equipment and software increases indicate business is investing to keep productivity gains increasing. Real exports of goods and services increased 5.8 percent in the first quarter, compared with an increase of 22.8 percent in the fourth. Real imports of goods and services increased 8.9 percent, compared with an increase of 15.8 percent. The good news is exports are increasing. The bad news is imports are increasing faster. While the increase in imports indicates consumer spending is increasing, it also indicates the trade deficit is increasing as well. The change in real private inventories added 1.57 percentage points to the first-quarter change in real GDP after adding 3.79 percentage points to the fourth-quarter change. Private businesses increased inventories $31.1 billion in the first quarter, following decreases of $19.7 billion in the fourth quarter and $139.2 billion in the third. Expect harping on this point, with arguments like "it's not real growth" or it can't continue. Considering the massive drop in inventories that we've seen over the recession the trend can continue for some time, so that argument is moot. In addition, inventory restocking is just as important an economic activity as, well, all other economic activities. Bottom line: this is a very good report and indicates the expansion continues. Prices gapped higher at the open (a) and then used the EMAs for technical support throughout the day (b), ending with a big buy trend at the end of trading on high volume (c). This is important because the IWMs represent risk-based capital. Yesterday's move indicated traders are comfortable with the idea of risk again. Of course -- we'll have to see how long that lasts with Europe on everybody's radar. With the longer market pictures, consider the following charts in two groups. The SPYs and the DIAs represent less risky stock capital while the IWCs and the IWMs represent more risk based capital. Notice that the larger cap indexes are moving more sideways right now while the riskier indexes are still more bullish. Also notice the difference between the MACDs. The SPYs and the DIAs are moving sideways and have been for sometime while the riskier assets have a bit more upward momentum. This is on track with how the averages have performed on a relative basis for the last few months: the riskier assets have outperformed the less risky assets. Prices gapped higher at the open (a) and then spent the rest of the day in a tight range (b). The daily chart is showing some interesting signs. First, remember this is April -- a month before the summer driving season. Oil prices should get a natural lift right now. In addition, there are some bullish indicators. While prices did break the general uptrend (a), they have consolidated twice (b and c) in downward sloping pennant patterns. The EMAs are mixed (d). The short term EMAs (10 and 20 day EMA) are moving lower while the longer EMAs (50 and 200) are moving higher, albeit in a mellow upward slope. However, the shorter EMAs are more volatile and hence more prone to whipsaws. Prices yesterday broke through important upside resistance (e). The MACD is on the verge of giving a buy signal (f) and the A/D line shows continued accumulation. On the bearish side, we've seen an inventory build-up, while the bulls can look at Asia and US demand increasing. On the "very interesting and possible concerning side" is the drop in industrial metals. Prices have broken the two main uptrends (a and b). We saw a big drop down on Monday (c) in reaction to the European situation. In addition, the 10, 20 and 50 day EMAs are moving lower (d), while the 10 day EMA has dropped through the 20. The MACD has given a sell-signal (e) but we're still seeing some money flow in. Prices can't get meaningfully above the 200 minute EMA. Part of this is risk aversion -- that is, the European situation is causing people to move into more stable assets. Part of the recent drop is increased Chilean production. But I have to wonder whether there is concern in the industrial metals market about the expansion itself. 1.) The Leading Economic Indicators are pointing up strongly. 9.) Initial unemployment claims -- while still high -- have dropped and the rate of job losses has decreased. 10.) Other countries are now printing positive GDP numbers. Since then we've seen continued improvement. I should also add the economy is currently expanding in pretty much the manner I outlined last August. Take a look at the following charts of the IEI (3-7 year Treasuries), IEFs (7-10 year Treasuries) and the TLTs (20+ year Treasuries). Notice that each of these sections of the curve is in an upward sloping channel. Also note that all three are at important areas of technical resistance in the form of a downward sloping trend line. Fundamentally, US Treasuries have caught a safety bid -- that is, investors have purchased Treasuries because of the increased risk in the European area. In addition, recent auctions of record amounts of debt have gone well (see this recent update from Briefing.com). But on the flip side of the safety bid is a renewed risk appetite as seen in today's market action so far. So - the question is, is there sufficient upside resistance in the Treasury market to prevent the current safety bid rally from continuing higher? While I am pleased the number dropped, the main issue going forward is getting this number below the 450,000 area. When we see that number move into the lower 400's and below I will be very pleased. I'm more sanguine about the trend. There was no weekly claims number under 450,000 until February 6 of this year. Today is the third such number in the last 6 weeks. Conversely, there has only been one weekly claims number above 465,000 in the last 8 weeks. The trend, as shown in the 4 week moving average, remains clearly downward, albeit not as steeply as last year. Based on the previous 5 months, the 4 week average for April is consistent with net job growth. There were several important story lines yesterday. First, we saw a stabilization of the equity markets. The SPYs found upside resistance at the 20 day EMA. The IWMs found support at the 20 day EMA. Prices gapped lower at the open (a) and attempted to move through the 200 minute EMA twice (at points b and c), eventually breaking through at point d on higher volume. On the daily chart of the TLTs, notice that prices are falling back to the downward sloping line of resistance (now support). That is an important development. Treasuries caught a strong safety bid at the beginning of the week as a reaction to the European situation. But the upward move ran against a big fundamental issue of increasing supply and a long-term head and shoulders pattern. In other words -- there are strong downward pressures in the market as well. Yesterday's move could indicate that the supply issue is still very strong in the market. We have a break-out from a triangle consolidation pattern which fell back to the top line of the triangle only to rally again. However, in the last two days at (a) we've seen two large bars printed on very high volume (b). In addition, the EMA picture (c) is bullish -- the shorter EMAs are above the longer EMAs, all the EMAs are moving higher and prices are above the EMAs. However, this is not the strongest upward move possible -- and certainly not the one I would expect considering the overall macro environment. I would expect a far stronger move. General Electric Co. said Wednesday that the broader economy and its own industrial and lending businesses are improving, signs the "clouds are breaking" after one of the worst years ever for the company. Some key economic indicators have stabilized, including the high unemployment rate and the decline in housing prices, GE told investors at its annual meeting in Houston. Bank losses have stopped growing and capital markets have improved, a positive sign for GE's troubled GE Capital lending unit that has been the source of many of its problems. "The forecast ahead of us is promising," said GE chief executive Jeffrey Immelt. Only one city saw a month to money increase in prices in February. That tells us prices have not found an equilibrium level. There has been a blog war going on in the last month between Matt Trivisonno and Zero Hedge concerning tax withholding. Trivisonno contends that withheld taxes have been surging. Zero Hedge contends that there has been a "collapse" in tax withholding. Considering this data is public record at the US Treasury's page, there should be no debate. You are about 5 clicks and less than a minute away from double-checking either of their claims. Trivisonno has put himself under a disadvantage. Since Karl Denninger cribbed his work without credit last year, Trivisonno took his up-to-the-minute graphs offline, and then made them Member Only. You can see a pretty useless 90-day-old graph at his site. Zero Hedge, by contrast, has been updating its work (but selectively as we shall see) weekly. As readers of this blog know, I include the daily statements in my Friday summary of Weekly Indicators. I should state that I started this because I believed Trivisonno failed to take seasonal factors into account, when he announced a catastrophic dropoff in collections between Q1 and Q2 in 2009, when records of past years showed that there has always been a substantial decline from Q1 to Q2, including during years of economic expansion. I am going to take sides. Trivisonno is correct. Zero Hedge has zero credibility on this subject, and its most recent post appears to be actively misleading. As I said, Zero Hedge has been updating its graphs weekly. For "week 15" (ending April 16, 2010), it included a nice weekly graph of tax receipts in its post. I haven't checked every single week, but I did check the last 3, and I can tell you that Zero Hedge did correctly total weeks 13 and 15, both of which showed 2009 receipts running ahead of 2010 receipts (by $2,831B and $5,723B, respectively). But week 14 was suspiciously an outlier, showing less than $11,000B for receipts both years. Trivisonno called them on it, saying the total was laughable. And indeed it is. For the week ending April 9, 2010 (week 14), the Treasury took in $28,561B vs. $23,831B in 2009, meaning 2010 was ahead by $4,730B that week. We promised we would update the US Treasury individual tax withholdings comparison between 2009 and 2010 by 4 week bucket. Week 16 data is now out and the result is below. It speaks for itself. As for withheld corporate tax, we would discuss that too... if there was anything to discuss. And there is no weekly graph. Instead, there is a 4 week successive graph purporting to show that receipts have collapsed in the last 20 days. So, what actually happened in week 16? In 2010, $32,594B was collected, vs. $29,332B in 2009. In other words, 2010 was ahead by $3,252. Zero Hedge, for some reason, didn't choose to tell that to its readership. In short, in both weeks of April 2010 where tax withholding was comfortably ahead of 2009, Zero Hedge misprepresented or ignored the data. And they literally picked what may have been the only 20 day period (on a rolling basis) in the last month or so where 2009 taxes were slightly ahead of 2010's - by less than $0.6B My Weekly Indicator column used a 20 day result only 2 days before that showed 2010's results ahead by $130.0B vs. $118.6B, a gain of $11.4B or +9.6%. (The culprit is one single outlier: 4/23/10 vs. 4/22/09, on which $2.310B vs. $7.447B was collected, respectively). For that reason, I say that Zero Hedge has Zero Credibility on withholding tax receipts. And by the way, through the 26th, 18 workdays into the month, April 2010 as a whole is running comfortably ahead of April 2009, $121,724B vs. $113,067B. Consumers’ appraisal of present-day conditions was more positive in April. Those claiming conditions are "good" increased to 9.1 percent from 8.5 percent, while those claiming business conditions are "bad" declined to 40.2 percent from 42.1 percent. Consumers’ appraisal of the labor market also improved. Those saying jobs are "plentiful" increased to 4.8 percent from 4.0 percent, while those saying jobs are "hard to get" decreased to 45.0 percent from 46.3 percent. Consumers’ outlook was also brighter in April. The percentage of consumers expecting business conditions will improve over the next six months increased to 19.8 percent from 18.0 percent, while those expecting conditions will worsen declined to 12.6 percent from 13.6 percent. Consumers were also more optimistic about the job outlook. The percentage of consumers anticipating more jobs in the months ahead increased to 18.0 percent from 14.1 percent, while those anticipating fewer jobs declined to 20.0 percent from 21.4 percent. The proportion of consumers anticipating an increase in their incomes declined to 10.3 from 10.8 percent. The real story here is the straight line for the last year; consumers are definitely in a "show me" state of mind. Yesterday's action was severe. It could probably be a short-term (3-6 week) game changer. The market has been technically overbought for some time, but needed a fundamental event to to trigger some selling. Yesterday could have been such an event. Let's take a look at several markets to see what's going on. Prices gapped lower at the open (a), formed an upward sloping channel but ran into upside resistance at the 200 minute EMA. Prices then took a nosedive (c) on extremely heavy volume. Prices attempted two small rallies (e and f) but sold off into the close (g) on heavy volume (h). End of the day, heavy volume sell-offs are very bearish; they indicate a high level of concern for negative news coming out overnight. Notice the very large bar that went through the 10 and 20 day EMA on very high volume. These are both important technical events. Notice the more of less same patterns with the IWMs (Russell 2000) BUT the daily chart did not take out two EMAs. Let's move onto the bond market. First, notice that all sectors of the market rallied yesterday -- and all moved through important resistance levels. Notice that the long end of the curve (the TLTs) saw a massive influx of money -- the volume spike is huge. This is a very important move as it indicates traders are either, a.) unconcerned about inflation or, b.) don't think interest rates will by rising anytime soon. What is very interesting about the above move in the Treasury market is also dealing with two other issues. The first is fundamental -- there is a ton of supply hitting the market this year. While there is talk of the total amount of debt being less than anticipated, there is still a lot of debt coming to market. More importantly, there are several large auctions this week. So, the threat of a Greek default and/or the need for safety is stronger then the concern about supply. Also note the US is now considered a safe haven relative to Europe -- this in spite of deficit concern. The multi-year chart shows a clear head and shoulders pattern at the long end of the curve, which is at the end of a 30 year bond rally that has sent rates to multi-generational lows. It's certainly not unheard of for short-term market issues to take control of multi-year patterns. However, it's important to remember that the short-term issue is taking control of the market right now. Yesterday, prices gapped higher at the open (a) and then rallied (b) with some impressive volume spikes (c). Prices then sold off in a disciplined manner, only to rally again (d) with impressive volume inflows at the end of trading (e). The daily chart shows a strong uptrend in place, along with a very bullish EMA picture -- all the EMAs are rising, the shorter EMAs are above the loner EMAs and prices are above the EMAs. Finally, prices are near important resistance levels. This charts tells us the dollar is still considered a safe-haven currency. On the long term chart, prices are right at the 200 week EMA -- a very important technical level. 1.) The markets took a massive , fundamental his yesterday. However, as I've noted a few times (for example see this post and this post), the market is over-extended and needed to pull back from current levels. 2.) The bond market is a clear winner. On the flip side, however, are two issues: first, interest rates are really low, meaning traders have made some decent profits. When will they start to take them? Second, there is still the issue of supply. While yesterday's action clearly changed the short-term perception in the market, how long will that last in reference to the US' continued need to borrow large sums of money? 3.) The dollar is now a safe haven currency, largely at the euro's expense. But the dollar is at very important weekly technical levels (the 200 week EMA). We need to see how prices move through this level. Shipping giant UPS is optimistic about the economic recovery it is seeing in countries where it does business around the world. The company made the comments as it formally reported Tuesday a nearly 33 percent rise in first-quarter profit to $533 million, or 53 cents a share, compared to a profit of $401 million, or 40 cents a share, a year earlier. UPS, based in Atlanta, pre-released earnings results on April 14. There is a clear uptrend in place (a) and prices have broken through important resistance (b). The EMA picture is bullish (the shorter EMAs are above the longer EMAs, all the EMAs are moving higher and prices are above all the EMAs). However, momentum is near a topping out point (d) but there is plenty of money flowing into the average (e). I have been particularly interested in April's car sales number, as it will be the first since January that won't be distorted by events at Toyota. In February annualized sales were 10.3m (as Toyota's sales fell dramatically). March's 11.8m annualized sales were fueled by the resulting Toyota incentives. Additionally, Spencer at Angry Bear contends that, as gas prices go up as a share of disposable income, car sales go down. So, have rising gas prices taken a bite out of auto sales? Edmunds.com analysts predict that April's Seasonally Adjusted Annualized Rate (SAAR) will be 11.2 million, down from 11.8 in March 2010. According to another Satwaves source, sales are off the charts across the board with Ford (NYSE:F) once again posting exceptional sales numbers, especially Taurus and Fusion sales. My source indicated that the SAAR rate could surpass the 14 million unit mark when the April sales numbers are reported. Such a number would dwarf Sirius XM Radio’s (NASDAQ: SIRI) guidance of 10.5 million, as well as analyst estimates of just 11 million units. Edmunds' estimate should be taken with several grains of salt, as it is frequently off by a million or more units annualized. Satwaves' 14m estimate should probably come with an entire shaker. Nevertheless, if true, Edmunds' estimate must be regarded as a good number, as most of the sales increase held after incentives were greatly reduced. Additionally, if true it means that gasoline prices have not yet caused a reversal of the improving trend in car sales. I'm going to change some things around on the site. First, you'll notice that the "big story" section of the blog is gone. The reason is simple: I am becoming more and more involved in "inter-market analysis," meaning the inter-relationship of all the financial markets. For example, as good economic news has been coming out we've seen equities rally. This has placed downward pressure on bonds. In addition, a stronger equity market means a stronger dollar. In short, all markets have an effect on other markets, so I am going to expand the yesterday's market section to include an analysis of a wider range of markets from the previous days action. Prices gapped higher at the open (a) but quickly fell (b) on heavy volume -- there were 4 trades before 10:15 CST that totaled more than 100,000/shares. Prices consolidated in an upward sloping channel, but fell again (d) on lighter volume. Prices rose in the afternoon on slightly higher volume. Prices topped out last Thursday and have fallen to find support right at 90. We've seen two consolidation patterns (b and c) right above 90. The SPYs had strong support at (line "a" or ~121.65) but couldn't hold support and made an equal distance move at (b) on stronger volume (c). Anytime prices can't hold until the end of the day, it signals that traders are concerned with overnight developments. Currently, those are Greece and the FOMC. Crushed Stone and Lumber are the two leading indicators of new construction (commercial and residential). Tracking these two economically sensitive commodities gives an up to the minute view of future construction. Recession or full-blown depression? These commodities could be key leading indicators. As with all Railshare data, these charts track shipments through the week ending on the preceding Saturday. Also remember the bullish lumber chart from last Wednesday.